I just bought a Fallkniven F1...... again! Discussion in 'Edged Tools' started by mtwarden, Nov 6, 2018. I had an F1 years ago that I used a lot. I ended selling it as the lure of customs took its hold. NorseRanger, AdirondackBadger, Barry J and 39 others like this. They seem to be going for about $120. now. I got one back in January for $85. Couldn't resist. americanstrat98, Bobsdock, MountainWanderer and 5 others like this. Love mine! It rides in my get home bag every day! Morris777, Timex, Bobsdock and 6 others like this. One of those knives that everyone should own at least once. I too was long ago lured by high end and customs but if I were stranded with just the F1 I'd be happy. I sure do wish they made full tang blanks. Barry J, Morris777, Timex and 7 others like this. I keep mine in my fishing bag where I feel its a perfect fit. I paid $84 shipped for mine last winter and I feel for that price its excellent. Timex, Bobsdock, MountainWanderer and 4 others like this. Timex, Ptpalpha, Bobsdock and 5 others like this. FYI: I wondered about the F1 Zytel sheath and if it was a glass-filled nylon (like the Cold Steel SecureEx). I received a prompt reply from Fallkniven that the sheath did not have glass reinforcement. Barry J, JV3, Bobsdock and 5 others like this. where did you find one for $84-85? Timex, Bobsdock, MrFixIt and 2 others like this. I ordered mine from Walmart in January. At the time, there were two inexpensive ones listed by sellers on their site - Walmart themselves and "The Roost". The Roost still seems to have relatively low prices out on the web, but that is about $120 at present. Timex, Bobsdock, MrFixIt and 3 others like this. they used to make F1 blanks, evidently not anymore? BetterNotBitterIsSurvival, Poeschel, central joe and 8 others like this. Do be wary of low-priced fakes. I haven't scanned the holographic tag on mine to see if it is genuine, as I don't have a smart phone. However, I can clearly see the lamination line in areas of the blade which would be nearly impossible to fake. I have a couple laminated Japanese kitchen knives, so I know the look. Barry J, Timex, central joe and 7 others like this. yeah it's a pity they don't make the full tang blanks any more..that's why i have commissioned a local maker to make his version of the F1 for me...i have owned the original for about 11-12 years now and it has traveled around the world a bit with me...it is just such a practical and non-aggressive looking knife...wish the handle was a little bit thicker..that is also one of the reasons why i have decided to try a 'custom' one..but definitely love the original! Barry J, Morris777, central joe and 9 others like this. As a general purpose field knife, the F1 is hard to beat. It's not perfect, (no knife is) but it checks a lot of the boxes. 45jack, Barry J, Timex and 10 others like this. I am SO happy I got a blank while they were still being made. There was an issue with chinese counterfeit blanks, so Falkniven quit making them. Too bad. it was a great way to get an excellent knife with a custom handle. Barry J, central joe, Madwell and 3 others like this. Fallknivens are great knives but I almost threw my F1 in the trash! Medicine maker, Barry J, Morris777 and 16 others like this. central joe, M.Hatfield, XMP and 3 others like this. Wal-Mart around this time last year. central joe, Bobsdock, lopie and 1 other person like this. central joe, Bobsdock, USMCPOP and 1 other person like this. Strangely I was digging through some knives yesterday looking for one to put on a cord and wear around my neck that could do more than the neck knife I had been wearing. It has bone scales however with some brass bolsters. Thing is about 1/8 inch thick but a full flat grind on it with a small convex on the edge. it has relatively thin handles so I"m thinking of putting a bicycle inner tube piece over it to kind of smooth it out for use and such. Now I'm thinking I have an F1 somewhere and I may just swap it into a point down sheath with a neck cord and use it since I know the metal and stuff and the grip is fine for my wants and needs. 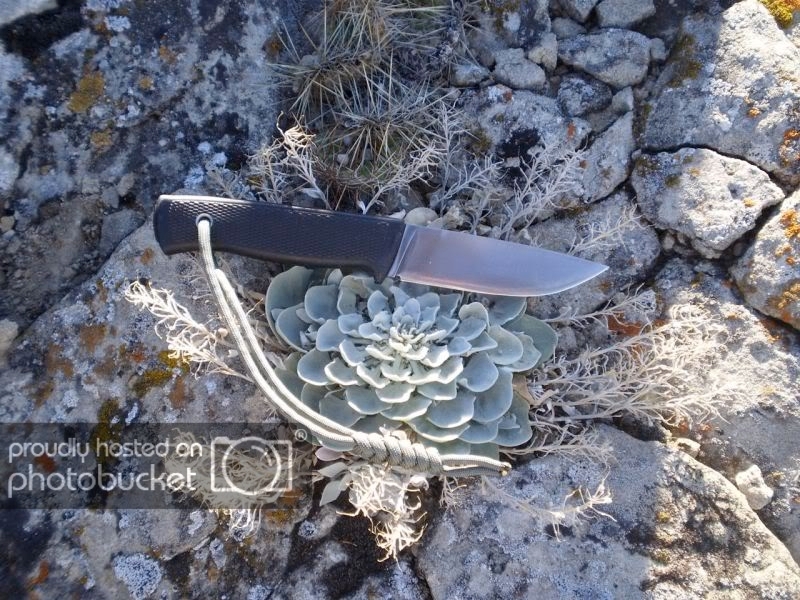 Essentially this knife purpose is similar to what I would use a folding sod buster with a 4 inch blade, but with a fixed blade and a bit thicker. I'd like to get it in 3/32, but 4/32 (1/8) will work and is easy enough to slowly work down with stones If I really want to. I haven't really used this style blade for a few years, moving from small mora style blades or using the BK 17 which is still my favorite general purpose blade these days, But having one around your neck under your shirt is just as handy as a pocket, something that is nice to have when you don't want to go hunt up a specific tool for a specific job. A general purpose blade. Aye the F1 falls into that same style knife, just needs a neck sheath that is a bit less bulky and boom I'm a happy man for that tool want. Morris777, central joe, Bobsdock and 3 others like this. so... the lanyard will go through the knife? meaning, you have to take it off of your neck to use it? Do you have a sheath you fully trust that can be the connection point between knife and lanyard instead? I know the CRKT Folts mini bowie -- https://www.amazon.com/CRKT-Minimalist-Bowie-Neck-Knife/dp/B0030IT76C -- is very small, but I have it and love it. The sheath is still functional and I've worn it for almost two years using it almost every day. agreed. I also have a house key on my neck knife. I'm going to get a 2" firesteel to attach to my neck knife lanyard. Sometimes I leave my house with nothing more than my neck knife and house key and someone then leaves and locks the door. Or my kids will lock the door and laugh at me through the glass. Barry J, central joe, Bobsdock and 1 other person like this. ...wish the handle was a little bit thicker..
One has to remember this knife is designed as a pilot's survival knife, which means it will be carried way more than it's ever used and needs to be as unobtrusive as possible in the confines of a cockpit. 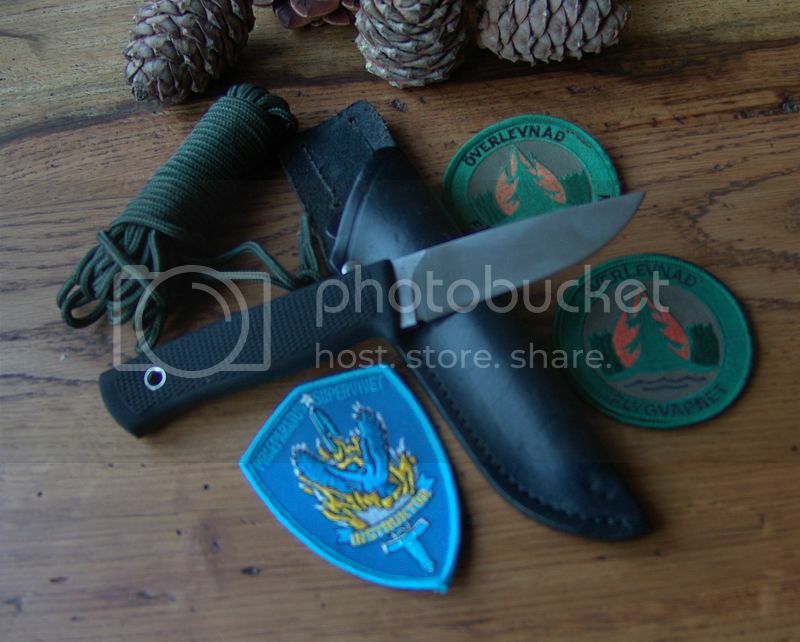 The F-1 sheath and knife combo pulls this off very neatly, which isn't to say I'm a total fan of the sheath. My own preference for knives with a thinner profile stems from the same basic reason, I carry a sheath knife all of my waking hours, I don't need it getting in the way. Barry J, Morris777, central joe and 6 others like this. I actually like the Fallkniven Zytel sheaths. I know some guys don't. But when your knife gets damp in freezing conditions, the logic behind a sheath that doesnt fit the shape of blade and handle so tightly is very apparent. Morris777, central joe, JV3 and 3 others like this. Medicine maker, Barry J, central joe and 6 others like this. I'm a big fan of the F1 and own several. It's one of my 'crazy hard raining in the Pacific NW' day knives. Yes, I own plenty of carbon steel knives set up in nice leather sheaths. I do take care of those. But sometimes it's real nice to strap something on to your belt that needs a lot less care & attention in the existing conditions. Barry J, Morris777, ra2bach and 10 others like this. Morris777, central joe, trafficjuzz and 4 others like this. My Cheap Gene protects me from knives over $100., but at $85 I got the fever. BetterNotBitterIsSurvival, central joe, JPinTX and 2 others like this. I love lots of things about the F1, but I never loved the thickness of the blade. I sold mine, but occasionally miss it. Yes, the F1 is way thick. That's my only gripe. central joe, CoolBreeze135, Bobsdock and 2 others like this. central joe, ra2bach, CoolBreeze135 and 5 others like this. Morris777, central joe, trafficjuzz and 3 others like this. Yep, being a survival knife, the F1 is rather thick. - - I do like the knife. But for use while doing various chores on the homestead, I’ve recently rediscovered the Mora 2000. Its thinner blade profile often comes in handy. Morris777, central joe, mtwarden and 3 others like this. Medicine maker, Barry J, Morris777 and 12 others like this. Enjoy your new, old friend! central joe, mtwarden and ra2bach like this. central joe, mtwarden and WanderingFool like this. Not if I find it first! I lament not getting one(or three) when I could. central joe, MountainWanderer and mtwarden like this. central joe and mtwarden like this. This is one of the blanks I had made up some years ago. BetterNotBitterIsSurvival, turntail, M.Hatfield and 11 others like this. I am still kicking myself for not picking one up. I was heavy into Busse at the time and never gave them much thought. Now I realize I dont need a 3 lb knife and my F1 is a solid choice. 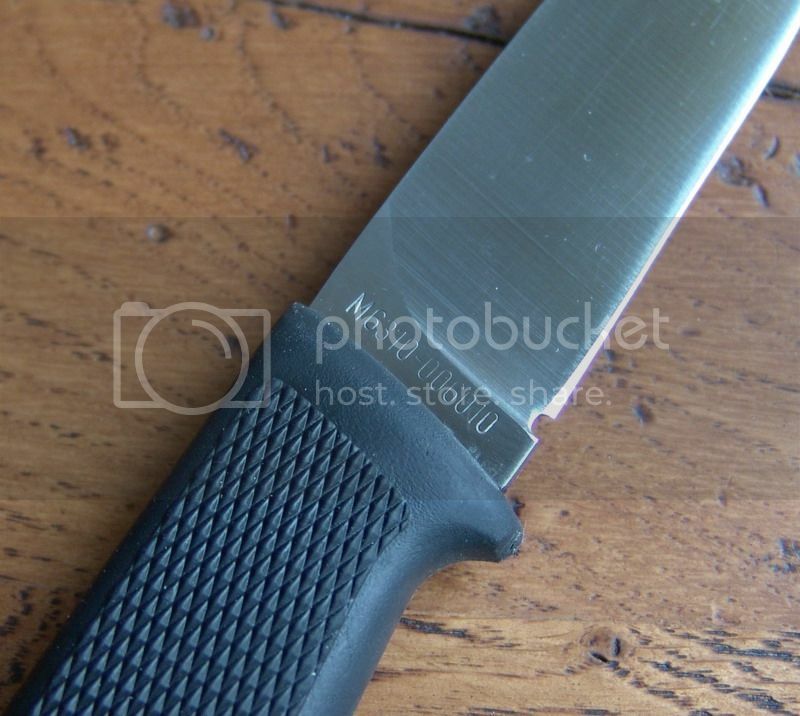 I have thought about one of the Bark River handled ones at kniveshipfree but I want to do my own handle and do want to spend 300 bucks on it. Barry J, Morris777, central joe and 2 others like this. I can honestly say that an F1 with the full tang handle is as close to being " THE perfect knife" as I have ever found. I love my rubber handled version and the zytel sheath is great for carrying a usable knife when canoeing, kayaking or working in the rain. But I was talking to a guy named John McCann at Uitwaaien last year and he let me look at his while I was comparing to the rubber handle. Perfection! The only negative thing I can find with the full tang version is the price. It is ridiculous for a production knife. Even so, I would likely buy one, but the newer versions have a silly jet etched on the blade. Paying a huge amount of money for a production knife with a silly jet etching, well.....that's where I draw the line, even with perfection. For quite sometime, the basic F1 in VG-10 with Zytel sheath & regular handle was a standard by which I judged other fixed blade outdoors knives. I could pick up a new F1 then from an authorized dealer for around $ 100. That was an excellent value in terms of utility for the money. I wish I bought a few blade blanks back then. I'm just not willing to pay what they charge now for someone else doing the handle work. Morris777, central joe, trafficjuzz and 2 others like this. I have first and the second version. The first model made in 1995. 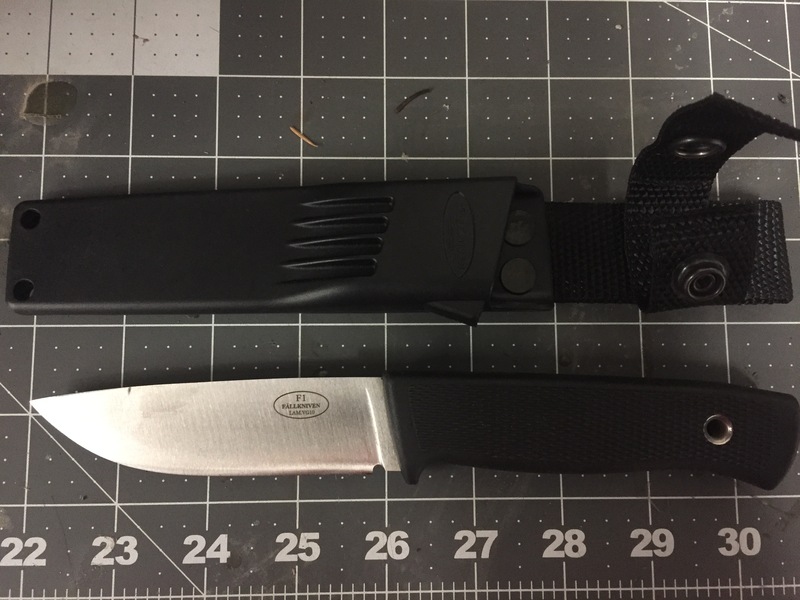 "M6310-006010 SLIDKNIV 211MM" pilot survival knife. There were 10000 made by Linder in Germany, all of them on a military contract. My second F1 F.AB SWEDEN ATS 34 Solingen Germany stamped on the spine "Serial#00451"
The first 15000 sold to the public. They all got serial number stamped on the spine like "Serial# XXXXX". These were also made by Solingen Linder. Some 5000 were later bought by the Military and marked accordingly. There was a prototype series of 500 with Titanium aluminum nitride (TiAlN) coating, but they were too expensive for mass production. Both in the leather sheath. M.Hatfield, AdirondackBadger, Barry J and 10 others like this. BetterNotBitterIsSurvival, M.Hatfield, AdirondackBadger and 8 others like this. I've looked at these about a thousand times but never pulled the trigger on one. I really need to snag one! John jr, Morris777, central joe and 2 others like this. central joe, trafficjuzz, Mr. Tettnanger and 1 other person like this. I traded for one sometime back. Maybe a year or so ago. Anyway I think it might was a fake. Hopefully someone can tell me. It has no F1 markings on blade. The blade steel seems laminated although I haven’t used it much. I assume the guy I traded here didn’t know. central joe, mtwarden, turntail and 1 other person like this. central joe, MountainWanderer, tashunka witko and 1 other person like this. central joe, tashunka witko and Rockgod1619 like this. I have an original F-1, but also deliberately purchased a forgery (it actually shipped from China) just to compare the two. The forgery is real close in appearance, in fact the lengths they went to in an effort to fake it are pretty incredible. Kind of left me scratching my head as for just a bit more expense they could probably give the real deal a run for its money. I've used the forgery to educate a few dealer friends of mine, in fact one of them had a forgery himself and wasn't aware of it until I showed him the differences, which are well described in the link provided by @mtwarden . Barry J, central joe, MountainWanderer and 2 others like this.